Imaginative Fiction - ZineWiki - the history and culture of zines, independent media and the small press. Imaginative Fiction was a science fiction fanzine by Jack Agnew, John V. Baltadonis, Harvey Greenblat and Robert Madle. Imaginative Fiction was published in the U.S.A. in the 1930s. Issue 1 appeared in 1935, and issue 4 appeared in 1937. In his introduction to The Best of Fandom 1958, Robert Madle writes, "Through Fantasy Magazine I discovered two other fan magazines: Charles D. Hornig’s memorable effort to create a publication just for the Weird Tales fans, The Fantasy Fan, and the official organ of the International Scientific Association, The International Observer. Following this came Wm. 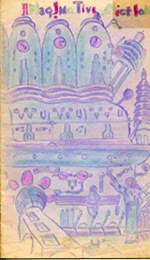 Crawford’s attempts to publish the fan’s dreamzines, Marvel Tales and Unusual Stories. By this time I had the bug myself and, along with three other Philadelphia youngsters, started on a carbon-copied fan mag called The Science Fiction Fan. This lasted one issue and we then published several carbon-copied issues of Imaginative Fiction. (“We” were Jack Agnew, John V. Baltadonis, Harvey Greenblatt and, of course, myself. All are still around with the exception of Harvey, who was killed in World War II.) During the following years many other publications rolled off our hektographs and mimeos. We were, indeed, fanzine fans!" Co-editors John V. Baltadonis, Robert A. Madle, and Milton A. Rothman, with Oswald Train, also published Fantasy Fiction Telegram from 1936 to 1937. John Baltadonis went on to release Fantasy Fiction Pictorial and assume editorship of Morris Scott Dollen's Science-Fiction Collector. Robert Madle released Fantascience Digest. This page was last modified on 13 September 2012, at 20:59.